Thousands of people gathered on Sunday in Budapest to demand PM Viktor Orban's resignation on the eve of German Chancellor Angela Merkel’s visit. Orban has been critical of the EU for alienating Russia and plunging into a painful trade war with it. 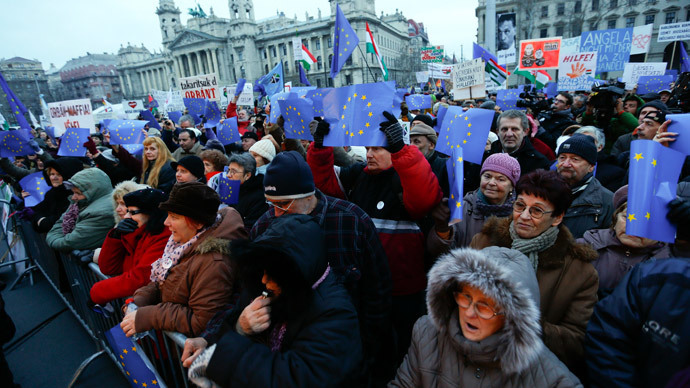 About 3,000 people rallied in front of the Hungarian parliament holding national and European Union flags chanted “Spring comes – Orban goes.” Many held placards calling for an end to corruption and protesting against the current policies of the ruling party. The protesters also held signs in German addressed to Angela Merkel which read: “We want to stay EU citizens!” and "Angela, don't negotiate with the mafia." They expressed their concern about Orban’s economic policies and his stance on relations with Russia. "We want to show that the country is not equal to Orban, that the majority does not support his policies going closer to Vladimir Putin," rally organizer Balazs Gulyas, the leader of last year's protests against the new internet tax, told AP. "The majority of the people want to be in the EU." A similar protest took place in Budapest at the beginning of January. Viktor Orban is a controversial politician, with critics accusing him of authoritarian trends. US Senator John McCain went as far as to call him a ‘neo-fascist dictator’ last year for maintaining close ties with Russia, which sparked a diplomatic scandal between Hungary and the US. The PM’s reforms are aimed at giving more power to the central government and more leverage on large companies and banks, the media and other centers of power in the country. He is also skeptical of many European Union policies and has vocally criticized Brussels for siding with the US in its sanction campaign against Russia, which harms European economies. Supporters view his action as defending Hungary’s national interests against international corporations and foreign governments with their own agendas. Among the biggest successes of the Orban government was the law that forced conversion of mortgages denominated in Swiss francs. The measure saved Hungarian borrowers from suffering a debt cost hike after Switzerland unpegged their currency from the euro, which resulted in it gaining some 20 percent in value. Despite all accusations his Fidesz party won landslide victory in last year’s general election, receiving almost 45 percent of votes and securing Orban third term as the Hungarian prime minister. The latest big challenge from street protests the Hungarian government saw so far came in October last year, when tens of thousands marched the streets of Budapest to protest a planned tax in internet. The controversial bill was scrapped in response. Orban will be in power until the next parliamentary election, which will take place in 2018.